Established in 2009, Hopa Casino is one of the best lightweight types of online casinos out there. Offering games from a lot of the top platforms like NetEnt, Amaya or NeoGames, the website is most famous for hosting one of the biggest selections of scratch cards available anywhere on the internet. Also, you’ll find the majority of your favorite slots there as well, but also a small selection of other casino-related games. See what all the fun is about at HOPA.com. There are more ways to win. You can play the games on the Hopa.com platform on your computer, laptop or on your mobile devices, be it a phone or a tablet. The website is licensed by the governments of the United Kingdom and Malta, and its owners are ASG Technologies Ltd Casinos. They also operate Karamba and Atlantic Spins Casinos. Although everything is kind of on the smaller side, at Hopa.com you’ll get your fair share of games and a fine presentation of gameplay. 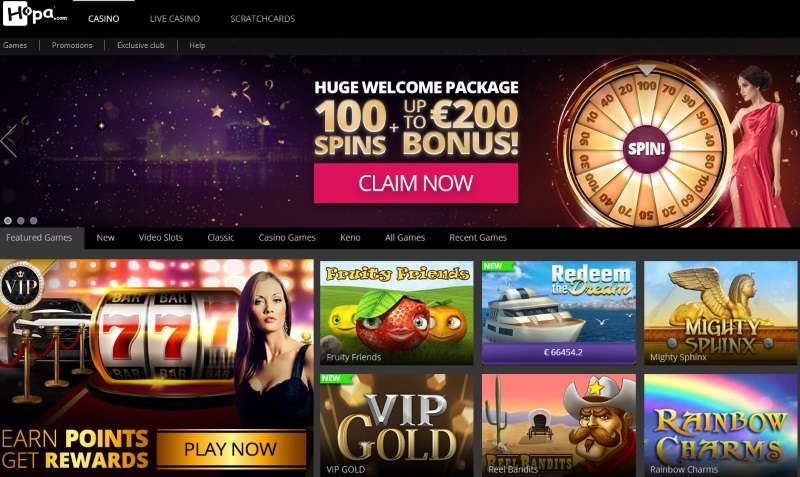 The main spectrum of Hopa.com’s avid players are the ones interested in scratch cards, which is the signature line of online games available on the website. The Hopa.com platform offers each and every scratch cards or scratch-based game you can ever imagine. Programmed by NeoGames, you’ll be able to play any scratch games you want, from your no-frills scratchers to interactive types of games with great graphics that look as great as any slots machine. Some of the most played scratch games are Meet Max, Golden Island, 3 Wow!, Forces of Terra and Postcards. If you’re more into slots than scratch cards, you can still have a great time on the Hopa.com platform, as they offer an array of slots from NetEnt and NeoGames. Regardless if you’re a fan of the traditional slots, or more into the newer, 5-reel video slots with high bonuses, you’ll be sorted for sure on the platform. You’ll get to play slots like Medusa, Starburst, Slot 777, Gonzo’s Quest or Fruity Friends, among a dozen other titles. Other games, like Joker Poker, Jacks or Better and a few more are also available at the Hopa Casino, although scratch cards and slots are its main attractions. You can also play the roulette if you’re into that, or try your luck and talent at a game of blackjack. The people at Hopa.com have been very inventive in this area, transforming these games into a scratch cards game with a unique format as if they were table games. Smart! You can get up to $100 in bonuses when you sign up for the Hopa.com platform. This might not be a huge sum, but most players find it more palpable to have a smaller bonus that they can play on, rather than having a huge sum that would take them months to wager and withdraw. All you have to do in order to get the $100 bonus is to simply deposit $100, as the bonus is just a doubling of your initial deposit. The bonus needs to be played in its entirety for 35 times in three months for the player to be able to withdraw any winnings. These conditions are standard among most online casinos, and will surely attract players on the website. Again, this might not sound like a large sum, but the money is guaranteed and you can be sure you’ll get your earnings at the end of the wagering period. There are a total of 28 possible methods for players to deposit money in their Hopa.com virtual account. You can choose between Bancontact/Mister Cash, Bank Wire Transfer, Boleto, ClickandBuy, EcoPayz, EnterCash, Entropay, EPS, Fast Bank Transfer, FundSend, GiroPay, iDEAL, instaDebit, Maestro, MasterCard, Neteller, Paysafe Card, POLi, Siru Mobile, Skrill, Skrill 1-Tap, Sofortuberwaisung, Ticket Premium, Transferencia Bancaria Local, Trustly, Ukash, UseMyFunds and Visa. When it comes to withdrawals, the possibilities are rather scarce, but still much better than a lot of other bigger online casino places. You can withdraw your earnings using Bank Wire Transfer, ClickandBuy, EcoPayz, Entropay, instaDebit, MasterCard, Neteller, Skrill, Skrill 1-Tap, Visa or Transferencia Bancaria Local. The withdrawal times differ from method to method. For example, you’ll get your money in 24 hours when you withdraw them to your EWallet. For credit or debit card withdrawals, the waiting times are 3 to 5 days, and for bank transfer, except to wait for up to 7 days for your money to get to you. There’s also a pending time of 48 hours before you can ask a withdrawal for the money you win. The withdrawal limit is set at 10.000 Euros a month. The site has its dedicated customer service, available via live chat and also by phone for 7 days a week. The schedule is from 07:00 to 00:00 GMT. If you’re encountering a problem outside the working hours, you’ll have to email the customer service people and wait for a reply during the next business day. Remember to always play as much money as you can afford to lose on these platforms. If you encounter any problems related to gambling addiction, seek help immediately.